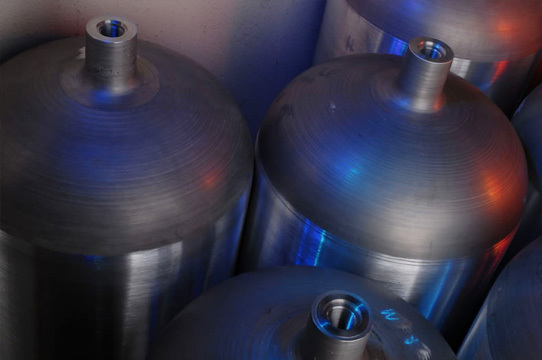 Luxfer has manufactured millions of Type-3 aluminum liners for cylinders in active service across a wide range of global markets, including SCBA and life support, medical gases, alternative fuel, paintball, and aerospace applications. Working with plate or cold-extruded tube, Luxfer can provide a wide variety of custom-manufactured configurations ranging in size from under two inches in diameter to over 120 inches in length. Luxfer’s in-house liner engineering team has in-depth experience and knowledge to provide insights into optimal liner design and manufacturing options for any given application. Previously sold under the Hydrospin brand (Hydrospin is a wholly-owned entity of Luxfer Inc.), Luxfer-supplied liners are used by numerous composite cylinder manufacturers around the world. All design-related specifications, drawings and tooling are maintained as proprietary information owned by our customers. Luxfer does not offer off-the-shelf liner products—all liners are made to the exacting requirements and specifications of our customers.